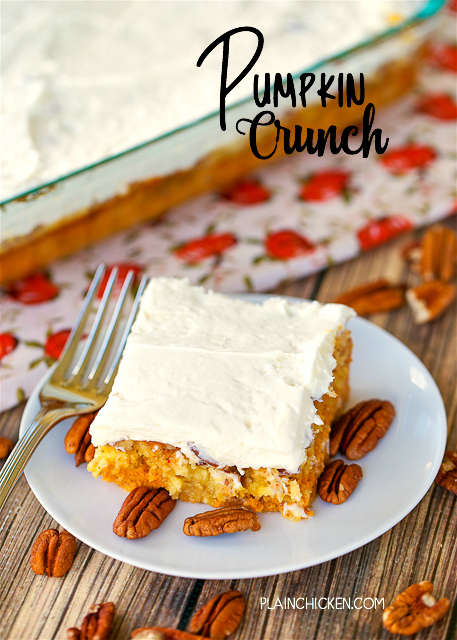 Pumpkin Crunch - I hate pumpkin, but I LOVE this cake!! SO easy! Pumpkin, evaporated milk, eggs, sugar, pumpkin spice, cake mix, pecans and butter. Frost with a mixture of cream cheese, powdered sugar and cool whip. SO good. I took this to a potluck and everyone cleaned their plate. The pumpkin haters were shocked when I told them what it was!! YUM! 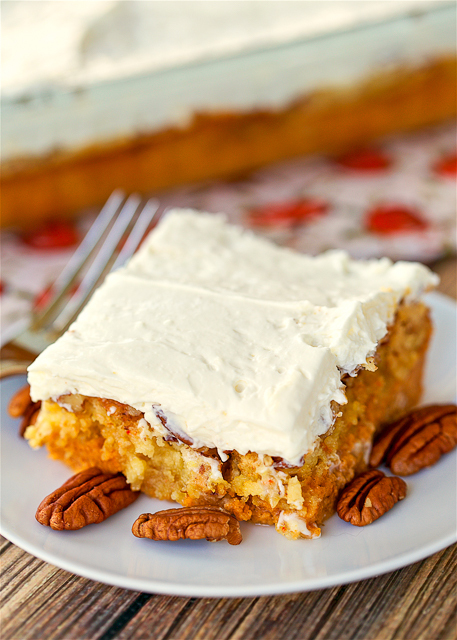 This is the recipe that made me realize that I liked pumpkin. My Mom made this years ago and wouldn't tell us what it was until we tried it. We all loved it and then she told us it was made from pumpkin. I would have never tried it if I knew it had pumpkin in it! I made this last week and took it to work. It was a huge hit. Everyone wanted the recipe. This is so quick and easy to make. It would make a perfect ending to a fabulous Thanksgiving feast next week. Mix pumpkin, milk, sugar, pumpkin spice and eggs and pour into 9x13 baking dish. Sprinkle cake mix on top. Sprinkle pecans on top of cake mix. Cover nuts with pieces of butter. Bake for 1 hour. Let cool completely. Beat cool-whip, cream cheese and confectioners sugar together and spread on top. How come this blog is not called "plain fat" cause if I ate all the good stuff you made that's what I'd be. this recipe has been on my 'to make' list forever!I need to get at it!! Yours sounds great Steph! I thought I hated pumpkin until I finally tried my Mother's pumpkin muffins that have butterscotch chips in them (although I do still hate butterscotch in anything else! )they're my favorite Fall treat and everyone loves them! I would love to have that recipe. This looks amazing. The kind of dessert that would be welcome at every gathering. Add it to the list. This recipe sounds great, thanks for sharing. This is also very good, hot out of the oven without the icing! I love the butter becan crunch on top! Made this yesterday for one of our Thanksgiving desserts. We loved it, even better today as leftovers. I had to promise my husband that I would make it every year! I made this for Thanksgiving and everyone loved it! I don't like pumpkin pie and I even liked it. Great recipe! Do you refrigerate if making day before ? Bettercseeved warm! have you ever substituted chocolate cake mix instead of yelllow cake mix? I haven't, but that sounds delicious! Don't guess it matters that cake mixes are smaller these days since is just a sprinkle? Does it matter if mix has pudding or not? Thanks. I haven't used a cake mix with pudding in the mix for this recipe, so I'm not sure if it matters or not. I have. It tastes fine, came out no different. I even used chocolate cake mix. Tastes yummy, at least to me. And we flip ours, so the top becomes the crust, and then top with whatever you want (whipped cream or cream cheese). I am guessing that you cool it before putting the icing on. Is that correct? I want to take it to a club meeting Tuesday. Yes - in step 4 it says to cool completely. Enjoy!